The Master Reference Architecture for Analytics Platform System will be updated with the latest generation of hardware and will be available for order from Hewlett Packard Enterprise (HPE), Dell, and Quanta in the spring of 2018. 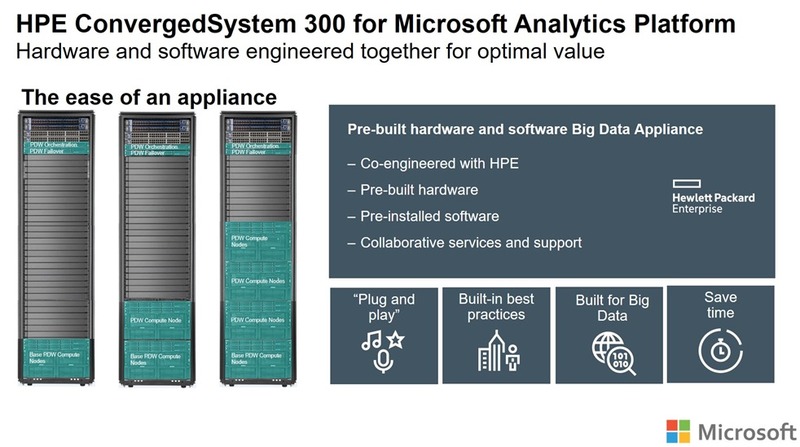 The HPE Analytics Platform System solution will be certified with the newly introduced ProLiant DL360 Gen10 servers for improved security and performance. Analytics Platform System is a massively parallel processing (MPP) data warehouse appliance that's capable of supporting large, complex mission-critical query workloads. In addition to the availability for new Analytics Platform System orders, this update will be available for existing customers who want to expand their storage and compute capacity by mixing the current generation of hardware with the new generation. New hard drive choices enable customers to support workloads up to 8 petabytes while taking advantage of a single solution for both structured and unstructured data. Customers can query and load big data directly into Analytics Platform System by using PolyBase. And customers can use new data with existing ETL solutions for fast and efficient loading process adoption through familiar T-SQL skills. This update will be part of the next Appliance Update (AU7) release for Analytics Platform System. Customers should be running Analytics Platform System 2016 (AU6) before upgrading to AU7.